Invitation of Expression of Interest (EOI) for Construction, Commissioning of Individual House Hold Latrines (IHHLs) in Urban Area of Jammu & Kashmir. Invitation of Expression of Interest (EoI) for providing of consultancy for preparation of DPR and technical supervision during execution of the project "Rejuvenation of Devika and Tawi River at Udhampur" under National River Conservation Plan (NRCP) scheme. RFQ for Development of Inter State Bus Terminal in Katra, J&K on Turnkey basis through Engineering, Procurement and Construction (EPC) mode. Extension Notice for submission of EoI under Swachh Bharat Mission upto 17.01.2017. EOI for selection of consulting services for preparation of proposal for assisting in Jammu & Srinagar cities to participate in the Smart cities challenges. The list of empanelment firms is annexed at "A"
Preparation of proposal for Assisting Jammu & Srinagar cities to participate in the Smart Cities challenges. RFP is meant only for Empanelled Consultants with MoUD, GoI. The list of which is annexed at "A" . Notice regarding extension of last date for submission of Technical Proposal for empanelment of Institute under EST&P component under NULM. 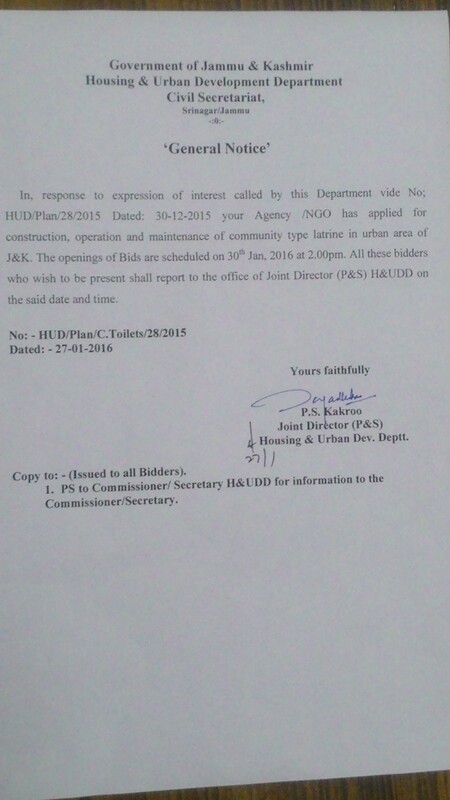 Re-scheduled openings of bids for Construction, operation and maintenance of community type latrine in Urban Areas.. Expression of Interest (EOI) for Construction, Operation and maintenance of Community Toilets in Urban Area of J&K. Proposed site plan for winter & summer zone is mentioned at Annexure "A - Winter Zone" & "B - Summer Zone"
Revised Bid document and reply to queries/clarification raised by different bidders for engagement of consultants for Providing Comprehensive Project Management Services for implementation of Urban Infrastructure Projects in J&K State through H&UDD. The bid submission date is extended from 12.09.2015 to 30.09.2015 upto 1.00pm and the bids will be opened on the same date at 3.00pm. Venue remains the same. Short list of the bidders who had applied for Resource Organization against this Department advertisement notice No. HUD/Plan/115/2014 dated 13.02.2015. Gist NIT No. 01 of 2015 -16 (e)- Lakes & Water Ways Development Authority (LAWDA). Notice for providing supplementary information for Expression of Interest under Skill Training Providers. The Technical/Financial bids which was scheduled to be opened on 18.08.2014 at 11:00am for empanelment of their training institute for imparting skilled training to the candidates to be sponsored under NULM has been postponed and now shall be opened on 28.08.2014 at the same time and venue.